Astronomy Science ~ One of the most iconic historic photo is now 25 years old today (14 February). On February 14, 1990, NASA's Voyager 1 spacecraft took a family portrait of the solar system, capturing Neptune, Uranus, Saturn, Jupiter, Venus and the Earth - which appears as a "pale blue dot" - in one view. This famous picture "continues to inspire awe us about the places we call home," said Voyager project scientist Ed Stone, from the California Institute of Technology in Pasadena, said in a NASA statement. Astronomer Carl Sagan later reference and then capture the image in the title of his book in 1994, "The Pale Blue Dot: A Vision of the Human Future in Space" (Random House). Sagan is part of the Voyager imaging team when the photo was taken. The first portrait solar system in one frame taken by NASA's Voyager on February 14, 1990, when this vehicle is more than 4 billion miles (6.4 billion kilometers) from Earth. Sequence: Venus, Earth, Jupiter, Saturn, Uranus, Neptune. Mars is too dark; Mercury is too close to the sun, and Pluto was too dim. Voyager 1 took photos of it while at a distance of 40 astronomical units (AU) from Earth, NASA officials said. (One AU is the distance from the Earth to the sun -. Approximately 93 million miles, or 150 million kilometers). Voyager 1 and its twin, Voyager 2, which was launched a few weeks apart in 1977 in charge of the trip that has never happened before, namely a trip to the outer solar system. Together, these two rides provide researchers first when looking at Jupiter, Saturn, Uranus and Neptune, as well as the large moons. Both spacecraft have continued to fly until now. In August 2012, Voyager 1 became the first man-made object to reach interstellar space; Voyager 2, which took a different route through the solar system will soon enter it as well. 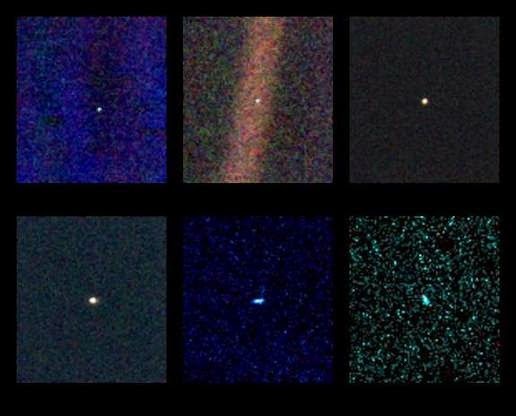 The series of images consisting of portraits "pale blue dot" is the last thing taken Voyager 1. Voyager 1 is currently located about 130 AU from Earth. If the vehicle is trying to take pictures of the earth now, the Earth will appear 10 times fainter than the photos taken in February 1990, NASA officials said.